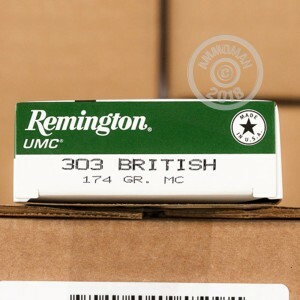 This full metal jacket ammunition (referred to by Remington as "metal case") is an excellent general purpose range and target load for .303 British rifles such as the Enfield series. 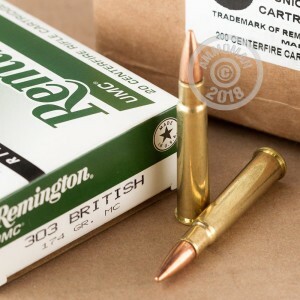 Manufactured in the US and sold under the venerable UMC brand, these cartridges fire a 174 grain bullet at 2,475 feet per second and produce excellent long-range accuracy. 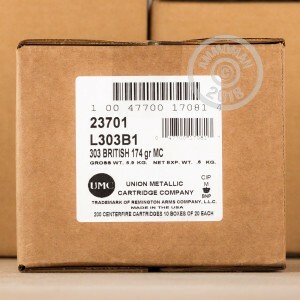 These cartridges come in 20-round boxes and use non-corrosive Boxer primers and reloadable brass cases. Grab over $99 worth of products at AmmoMan.com to qualify for free shipping!